존 매카시(John McCarthy, 1927년 9월 4일 - 2011년 10월 24일) 박사는 미국의 전산학자이자 인지과학자이다. 인공지능에 대한 연구 업적을 인정받아 1971년 튜링상을 수상했다. 리스프 프로그래밍 언어를 설계 및 구현하였으며, 1956년에 다트머스 학회에서 처음으로 인공지능(Artificial Intelligence)이라는 용어를 창안했다. ↑ “President's National Medal of Science: Recipient Details 1990”. National Science Foundation. 2006년 2월 14일. 2012년 9월 27일에 확인함. ↑ “AI's Hall of Fame” (PDF). 《IEEE Intelligent Systems》 (IEEE Computer Society) 26 (4): 5–15. 2011. doi:10.1109/MIS.2011.64. ↑ “IEEE Computer Society Magazine Honors Artificial Intelligence Leaders”. 《DigitalJournal.com》. 2011년 8월 24일 (2011-08-24). 2011년 9월 18일 (2011-09-18)에 확인함. 다음 날짜 값 확인 필요: |access-date=, |date= (도움말) Press release source: PRWeb (Vocus). 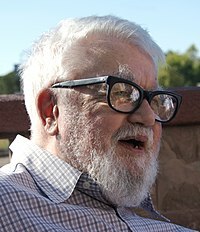 “John McCarthy”. 《수학 계보 프로젝트》 (영어). 미국 수학회. 이 문서는 2019년 1월 24일 (목) 06:13에 마지막으로 편집되었습니다.